Butea monosperma and Psidium guajava are traditional important medicinal plants. The plants were used in Ayurvedic unani and Siddha medicine for various ailments. Antibacterial activity was studied using extracts of Butea monosperma and Psidium guajava by agar well-diffusion method against E. coli and S. aureus. The ethanolic extracts of Butea monosperma flowers showed antibacterial activity against E. coli and S. aureus. In the same manner Psidium guajava leaf, extract showed antibacterial activity against E. coli and S. aureus. The objective of the present investigation was to formulate and evaluate herbal gel using specified concentration of powdered extracts of Butea monosperma flower and Psidium guajava leaves. Butea monosperma (palash) which is a medium-sized deciduous tree belongs to family Fabaceae and sub-family papilionaceae. Native to India, also called as "flame of the forest" is a medium sized tree, growing from 20 to 40 feet high, and the trunk is usually crooked and twisted with irregular branches and rough, grey bark. The leaves are pinnate, with an 8-16 cm petiole and three leaflets. It is seen in all its ugliness in December and January when most of the leaves fall: but from January to March it truly becomes a tree of flame, a riot of orange and vermilion flowers covering the entire crown. These flowers, which are scentless, are massed along the ends of the stalks dark velvety green like the cup-shaped calices and the brilliance of the stiff, bright flowers is shown off to perfection by this deep, contrasting color (6, 7). The plant shows various Pharmacological activities like antifungal, antimicrobial, antibacterial (4), anticonvulsive, anti-fertility, anti-inflammatory activity, anti-diabetic activity (1-3) etc. Guavas are common tropical fruits cultivated in many tropical and subtropical regions. Psidium is a small tree in family Myrtaceae. It grows 33 ft high, with spreading branches, the Guava is easy to recognize because of its smooth, thin, copper-colored bark that flakes off, showing the greenish layer beneath; and also because of the attractive, "bony" aspect of its trunk which may in time attain a diameter of 10 in. The main constituents of Guava are vitamins, tanins phenolic compounds, flavonoids, essential oils, sesquiterpene alcohols and triterpenoid acids (8, 9). These and other compounds are related to many health effects of Guava. The leaves of psidium guajava and the flowers of Butea monosperma were collected from the Pangali village in Gondia district in the summer season. The plant materials were authenticated by Dr. N.M. Dongarwar of Botany Department; RTM Nagpur University, Nagpur India. A voucher specimen No. 9282, 9283 were deposited at Herbarium, Department of Botany, RTM Nagpur University Nagpur. The Guava leaves were chopped and shade dried at room temperature then grounded to coarse powder. The powered plant material (350 gm) was packed into soxhlet apparatus and extracted upto (12 hr) with petroleum ether for defatting. It was then extracted with methanol for further 4 hr. The extract was filtered, and the solvent was evaporated under reduced pressure using a rotator, which was kept in desiccators for further use. The palas flowers were also extracted in the same manner by using methanol as solvent (5). The media of nutrient agar was prepared in a sterile condition for the antibacterial study. Table 1. Ingredients and Quantity of medium. The minimum inhibitory concentration (MIC) of the extracts of Butea monosperma flowers was determined for Escherichia coli, Staphylococcus aureus. The varied concentration of methanolic extractsof flowers (10 mg/mL, 50 mg/mL,100 mg/mL, 150 mg/mL, 200 mg/mL and 250 mg/mL) was added to 3 mL of Muelle Hinton broth tubes with 0.1 mL of bacterial suspension. Tubes were incubated at37 °C for 24 hours. After incubation the tubes were examined for bacterial growthby observing turbidity. The antibacterial activity was carried out using extracts from plant parts leaf, bark and flowers of Butea monosperma by using agar well diffusion method. Antibacterial activity was determined by measuring the diameter (mm) of zone of inhibition. The concentration of each plant part extract to be used for the method was calculated on the basis of their respective MIC values and twice the MIC values was used to determine the zone of inhibition. The culture was bulk seeded in Mueller Hilton agar and poured into petri plates, four equidistant 8 mm wells were bored into solidified agar plates and then extracts were added to the wells. The diameter of zone of inhibition (ZOI) was recorded in millimeters (mm). Ciprofloxacin (5 μg/mL) was used as positive control and respective solvents were used as negative control. The plates were incubated at 37 °C for 24 hours and zone of inhibition were observed. Table 2. Ingredients and Quantity of gel. 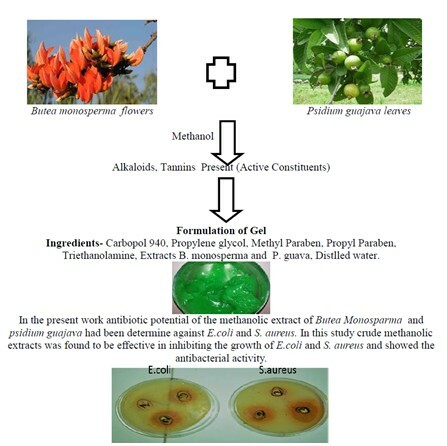 In the present work antibiotic potential of the ethanolic extract of Butea monosparma and methanolic extract of Psidium guajava had been determine against E.coli and S. aureus. 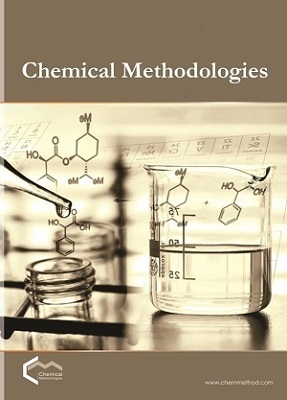 In this study, crude methanolic extracts was found to be effective in inhibiting the growth of E.coli and S. aureus and showed the antibacterial activity of two extract of Butea monosparma and Psidium guajava had been determine against E.coli and S. aureus. The gel formulation taking the combined extract conc. 24.6 mg/mL shows good antibacterial activity. This study indicates that the further attention should be given for research work to identify the active compound for their biological activity.